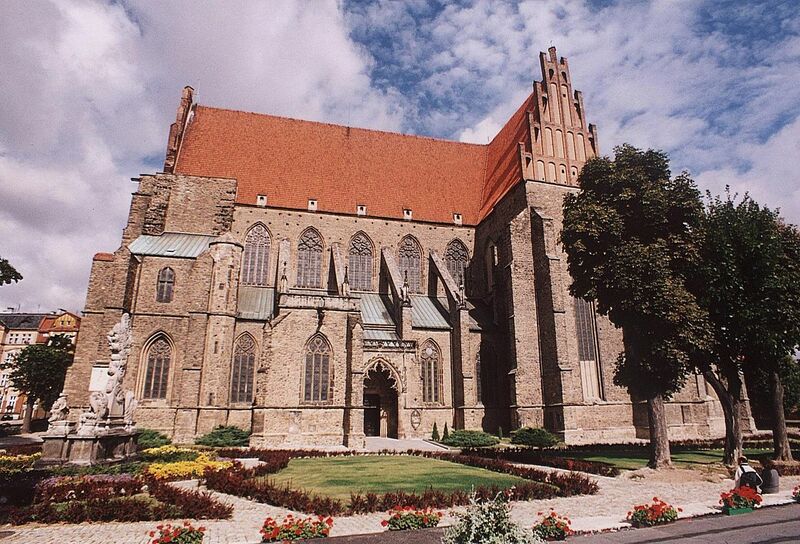 Is one of the largest and most beautiful Gothic buildings in Lower Silesia. 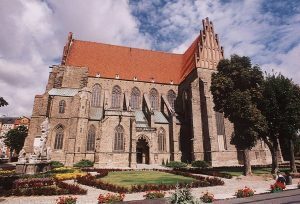 The construction of the temple started 1253. by Prince Władysław, and ended only in the mid-15th century. The Church was built on a Latin cross plan with granite and basalt rubble and brick, and sandstone. The Interior of the trójnawowe and pięcioprzęsłowe. The vaults of the naves of the network type of Star and cross. Length of the nave is a 76 m, the width of the three naves-26.6 m, height – 26.2 m. A unique, richly carved portals of the entrance gates. – the late-Gothic baptismal font from the 16th century. -the altar of St. Anna wood, Baroque, 1720-25 (created by Jan Jerzy Urbanski). -the altar of St. The cross, wood, Baroque, 1740. -the altar of szkaplerzny (the Carmelite one) with r. 1725. -Church Tabernacle, sandstone, Gothic, early 16th century. -a large number of gravestones from the 16th-17th century. On the Bell Tower of the oldest working Bell in Poland from year 1318. Donated by joannitę Przedbora with Widawy in Krakow. The next two from year 1405 and 1424.